Loop, as the rest of the collection, is inspired by the Fibonacci curve that is seen throughout nature and looks correct and balanced to the human eye. This apetizer bowl promises to be full all the time.. Perfection, elegance, always handy snacks!!!!! 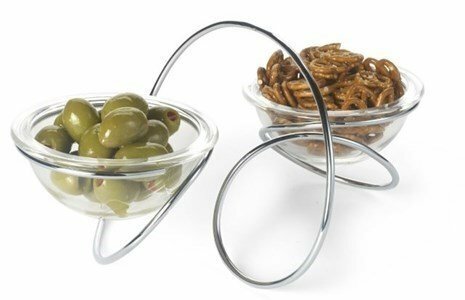 Loop bowl is perfect to serve apetizers. However, its use is rather embracing. Satisfaction is guaranteed at your dinner table, living-room or even as a decoration prop. These bowls are made of crafted glass and a chromed steel finished holder.